…it’s time to shake it up a bit and try something new. …you have an itch to scratch. …you just want to do something different. …you just wanna burn stuff. That time was a few weeks ago. Having received a small open BBQ and bought a heavy cast iron dutch oven, I wanted to do something with them. Nothing too involved just yet. This was, after all, the first time I would use the dutch oven. But just something a bit different. At Christmas, we have a tradition of making an oat based soda bread and serving this with homemade potted pork and/or smoked salmon. The bread is very easy to make, incredibly tasty and requires no yeast or even kneading. As such, it’s great for lazy people like me. Experience told me that this would be a great project just to get started with. Experience was right. Basically a Dutch Oven is a large heavy cast iron pan with a lid that can go directly on an open fire and is used to cook things. Things like stews, roasting meat or even bread. Made famous by the Settlers in the American West and now used not so much. Which is a shame. They are seen as hard work, requiring seasoning and special care. A pain to clean and maintain. Well yes, and maybe no. Once you’ve used them a couple of times and understand that cleaning should be done after use, and not three days later, then life becomes much easier. Cooking with them may require a bit of muscle but thats ok, the type of food you are going to cook will have plenty of calories in it and you needed that work out anyway. Cooking with them outdoors, can be done on gas but that just isn’t fun. Cooking with them outdoors is done on real fire, with real burning wood. Thats fun that is. There is a lot to write about fires and what type fire is best for which job. I’ll skip a lot of that here as most of the heat we need for soda bread comes from embers and not open fire. In fact, at a pinch and not as much fun, you could bake soda bread using BBQ briquettes. But you really wouldn’t do that, would you? Missing out on all that smokyness. That would be a sin! The link contains a lot of information about how & why it works without yeast and all that good stuff. Even if you only make it in a regular oven – it’s still a good bread to make. HINT – do not overwork the mixing. Read the recipe closely and understand what it does. Heat on top and (too much) below. When I did it, I had way too much heat on the bottom of the oven. This made the bread burn on it’s underside. So what would I do different? The BBQ I used was too small. This really limited the sort of fire I could build and amount of coals I could use. Limited is perhaps the wrong word, I had too many. Normally, there would be a fire to one side and coals would be taken from that and placed on and under the oven away from the main heat of the fire. Pencil figures are temperatures in degrees Celsius. Fresh Soda Bread still in the oven. Cleaning the Dutch Oven should be done as soon as is practical and don’t be afraid to re-season it. There was a poor defenseless little hibachi, desperate to be lit. He cried out for flame to ignite his charcoal. Flame was duly brought forward. Alas, the little heat the flame could bring was just not sufficient to support combustion of the little hibachi’s valiant charcoal. For in a few seconds, hibachi’s coals were hot. But too hot, the fire would not recede, the heat began to burn through poor little hibachi and then it was no more. Hibachi had melted. He was no more. The lure of the dark side had reduced him to slag. Never to be cooked on again. 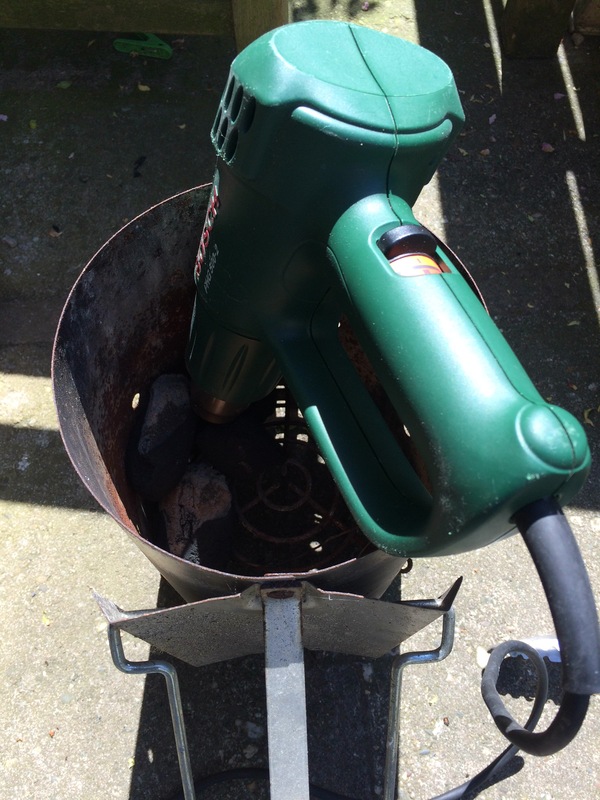 When lighting your BBQ, NEVER use petrol or other accelerants. They burn too quick, damage your grill and leave a nasty taste in your mouth – quite literally. Also, they are pretty dangerous. How to do it safely? Get the heat gun you use for stripping paint, put it on it’s hot setting and leave it for a few minutes…. 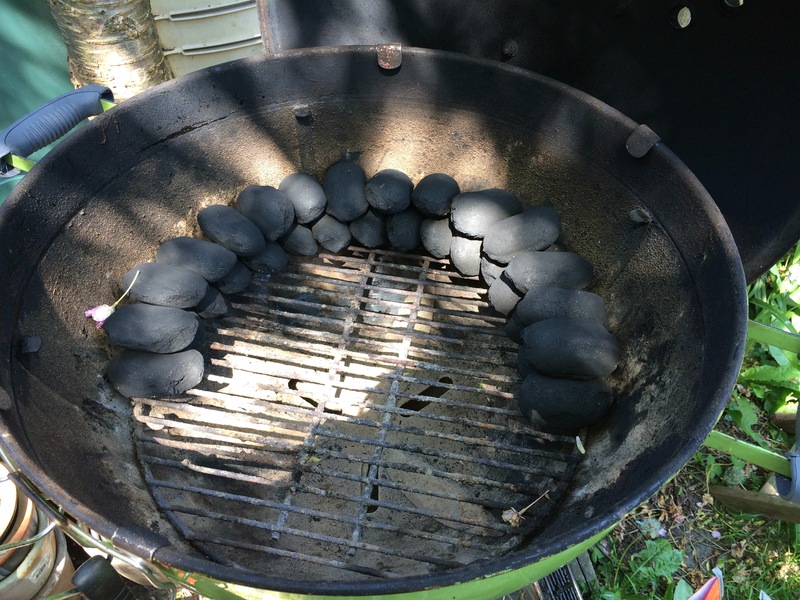 For a few briquettes – it looks like this and works a charm. Why only a few briquettes? I used them for starting a slow burn. If you have more to do then fire the heat from the bottom up.